How do you build a better place? It takes effective transportation solutions, good Urban Design, good planning, and the political will to make it happen. The great writers over at Transit Miami did a letter to Santa asking for important items that they need down in Miami so I decided to do my own letter to Santa for transit in Utah. -A stable source of income for transit systems here in Utah that would replace the very unstable sales tax. -More resources for bike riders including bike sharing and bike stations. -That the public will come to realize how much the hand of government and government welfare helped create the success of some of today’s biggest companies including retailers such as Wal-Mart. -Continued successful progress toward building our new light rail and commuter rail lines. -That BRT will be seen for what it is enhanced bus service but in no way shape or form an alternative for rail service. All BRT does is eliminate the benefits of the bus but creates few if any of the benefits of rail service. -That transit agencies will rid themselves of the bad philosophy that bus routes cannot duplicated each other. -Transit agencies will adopt a market matrix theory when it comes to creating transit routes. Los Angeles puts lipstick on a pig. With great fanfare, Los Angeles Metro will be introduced its new Silver Line service on Sunday. So is the newest light rail line to open in Los Angeles or part of the subway to the sea? No, actually it is combining service on two of the LA basin’s two busways into a single service and increasing the number of transfers. 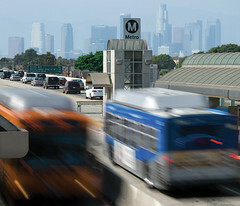 The first busway was opened 35 years ago extending from just east of downtown Los Angeles to the city of El Monte and traveled along the Interstate 10 freeway. There is a rail line between the busway that once carried the interurbans of the legendary Pacific Electric and is now home to the Metrolink Commuter Rail service to San Bernardino. The busway was later extended a mile to Union Station in the late 1980’s. When the busway first started a large number of buses would travel the busway to El Monte then fan out throughout the San Gabriel valley. After many cuts to bus service most of the San Gabriel valley routes were taken over by Foothill Transit in the late 1980’s leaving RTD with only a few routes on the busway. The second busway is the infamous Harbor Freeway Transit way that extends from Artesia to a few miles south of downtown and parallels the Long Beach light rail line that sits a few miles to the east. While the Blue line carries upwards of 78000 passengers per day the Harbor Freeway Transitway pulls in roughly 5000 per day. Now Metro will run a direct line from the Artesia station through downtown Los Angeles out to the El Monte station calling it the Silver line. This will give the first direct service between the two lines but will also mean that people traveling from the routes that currently use the busway will have to transfer to the new service as those routes will be truncated at El Monte and Artesia respectively. In addition the new Silver line will compete with Foothill Transit’s Silver Streak service that started a couple of years ago and operates from Pomona to downtown Los Angeles via the El Monte busway. Like Metro is doing with its lines, Foothill Transit also truncated most of its bus routes at El Monte when Silver Streak service was started. Isn’t it interesting that when most road warriors say that buses should be used instead of rail, they say that buses are more flexible and thus better than the rail option? Of course we all know the tired BS about BRT (Badly Repackaged Transit) being just like light rail but on rubber tires. In this case they are operating a bus route like a rail line but cutting the so called flexibility of the bus. What is interesting is that Metro’s predecessor the RTD tried to run truncate routes in El Monte and run a separate El Monte to downtown LA route back in the late 70’s. Route 495 provided frequent service from El Monte to downtown but was killed only a few months later. But let’s also look deeper into the two busways themselves. As stated before the El Monte bus way is celebrated its 35th year in 2009. While it is hard to quantify any development results being the fact that there is only three stations on the line with the two mid line stations being a University and a hospital, the end of the line station has seen no development in the area since its opening. In other words the place looks the same as it did in 1974 although plans are finally progressing to turn the station into a transit oriented development. Compare that to TRAX where development is starting to take place in several areas along the line. While progress has been slowed by the credit crunch, new homes have been built near several stations and when things heat back up in the real estate market you will several more projects come on line. The Harbor Freeway Transit way points to not only that busways are not an alternative to light rail but also the failure of Freeway Transit in general. While it is hard to judge the Harbor Transitway head to head against the Blue line despite their close proximity to each other, it is clear that the Transitway does not attract riders like the Blue Line. Meanwhile the Harbor Transitway also shows that Freeway transit is not an attractive option for riders. Whether it is a light rail station or busway station, freeway stops are noisy and inconvenient for riders. For those that have tried to access a station that sits in or along a highway know that they can be impossible to access due to the freeway and then noise levels are extremely high. Instead of spending $500 million on the transitway that carries few passengers, the agencies that built it would have been much farther ahead by pumping money into the overburdened Blue Line. Money could have been used to grade separate the line and then build a branch down to San Pedro (which would restore another ex-Pacific Electric line) build a branch to Torrance or southeast toward Orange County. Either of these options would have garnered more ridership that the pathetic transitway. The two busways also show the true reason why road warriors support busways over rail lines. When the El Monte busway first opened it was used exclusively for buses but then it seemed like good highway lanes for the taking so car pools were eventually allowed to use the busway. Every time I have gone down the busway in the last few years it has been more crowded that the main lanes on the freeway. Now Metro is planning to turn the busways into HOT lanes just line the car pool lanes here in Utah and reason behind the creation of the Silver Line. One has to wonder how long it will take before our state legislature passes laws stating that the BRT lanes along 3500 South and subsequent ones have to be open to automobile traffic of some form. The Silver line is doing nothing but putting lipstick on a pig. While it will make it easier to travel through downtown Los Angeles from the Harbor Transitway to the El Monte Busway, overall it does little to increase the travel opportunities in the region. It will be interesting to see what happens over the year or so. United Rail Passenger Alliance, Inc. Founded over three decades ago in 1976, URPA is a nationally known policy institute which focuses on solutions and plans for passenger rail systems in North America. Headquartered in Jacksonville, Florida, URPA has professional associates in Minnesota, California, Arizona, New Mexico, the District of Columbia, Texas, New York, and other cities. For more detailed information, along with a variety of position papers and other documents, visit the URPA web site at http://www.unitedrail.org. URPA is not a membership organization, and does not accept funding from any outside sources. 1) Finally, at last, after waiting oh, so very long (Too long, in fact. ), SunRail, the 61 mile long commuter rail system in Central Florida serving the Metropolitan Orlando area is about to be a reality. Just hours ago, the Florida Senate, meeting in a special session, passed HR 1, a bill to create SunRail and to also permanently fund South Florida’s Tri-Rail system. SunRail had failed twice before in the Florida Senate, two years in a row in the legislature’s regular annual sessions. The Florida House each time overwhelmingly passed the proposal, but a spiteful state Senator from the small city of Lakeland, Senator Paula Dockery, did her best to kill SunRail because she was mad her husband’s original, too-expensive, ill-advised bullet train scheme was made to go away by former Governor Jeb Bush almost a decade ago. In a rare change of places in politics, the Republicans were pushing for SunRail, and the Democrats were mostly against it. Senator Dockery, who is now running for governor in next year’s state elections, is also a Republican. Overall, SunRail had bipartisan support on many fronts, but the trial lawyers were originally against it because the original bill protected CSX, which is selling the track and infrastructure to the State of Florida for hundreds of millions of dollars wanted reasonable risk protection for any freight trains it would continue to run in off-hours when SunRail wasn’t running between Deland, a far northern suburb of Orlando in Volusia County (near Daytona Beach), through the heart of downtown Orlando via Sanford (home of Auto Train’s southern terminus), Casselberry, Longwood, and Winter Park all the way down to Poinciana, to the southwest of Orlando, near the theme park area of Orlando (Walt Disney World, SeaWorld, Universal Studios). There was a fuss by the unions, who claimed the Republican-ruled State of Florida government was union-busting. At the last moment, they came to an agreement through some sort of backroom deal, and the unions relented and allowed the Democrats to vote for SunRail. In the end, it all came down to politics and perception. SunRail was touted as a job creator (no doubt about that), and it was touted as a budget buster, taking money out of the mouths of babes and education opportunities away from school children, not to mention all of the alleged hospitals and clinics which wouldn’t be built because of the cost of SunRail. It was only when the Republican majority in the Florida Senate realized it wouldn’t be prudent to go against the Republican President of the Senate and the Republican Governor that some sense came into focus. In the mean time, United States Department of Transportation Secretary Ray LaHood came to Florida earlier this year and made it very, very clear if SunRail was not approved, and a funding source found for Tri-Rail, then Florida would be completely out of the running for any federal stimulus funds to build the proposed high speed rail routes in Florida. Added to Secretary LaHood’s admonishment were similar dire warnings from Republican Senator George LeMieux and Democratic Senator Bill Nelson (of NASA and space travel fame), as well as a varied assortment of Members of Congress. So, no matter how good the plan, how good the plan is for the citizens of Florida and Central Florida’s tens of millions of annual visitors from around the world, it all came down to a few votes and a lot of political pressure. Is that any way to run a railroad? – The majority of SunRail will run fairly parallel to Interstate 4, the main highway through the very middle of downtown Orlando. Interstate 4 is best described as a slow moving parking lot any time between 7:00 A.M. and about 8:00 P.M., and if there is a wreck, well, don’t plan on being home for dinner on time. As with all commuter rail systems, the sudden appearance of commuter trains will do nothing to alleviate traffic congestion; you couldn’t run enough trains with a two minute headway on a triple track mainline to take care of Central Florida’s driving problems. The benefit of SunRail is it will provide a reasonably priced, reasonable time alternative to driving on Interstate and surface roads, so almost every commuter in and out of downtown Orlando or commuters traveling from one side of Metropolitan Orlando to another will have the opportunity to take the train and possibly benefit. – The Orange Blossom Expressway, a second proposed commuter rail system in Central Florida will also benefit. This much smaller system will connect in downtown Orlando with SunRail, coming from far suburban counties to the north of Orlando. This system will travel over rails currently owned by a short line railroad. The start of SunRail could prompt this feeder system to get off the ground faster. – Everyone in the engineering and related fields, plus many in the construction industry will benefit, almost immediately. SunRail is probably one of the projects which is actually “shovel ready” and will have a relatively short construction window before beginning service. The current CSX infrastructure is excellent, and it won’t take much to upgrade what is already there to make it commuter-system ready. There will be some double tracking required, and the construction of local stations will take place, but none of those are years-long projects, especially with the year-round, construction friendly warm climate of Central Florida. – CSX will hugely benefit; it’s selling 61 miles worth of infrastructure it currently pays taxes on to the State of Florida for over $400 million, and it still gets to run as many freight trains as it wants over the tracks in off hours for – are you ready for this? – $1.00 a year (Yes, one dollar.). Additionally, CSX gets more tens of millions of dollars to upgrade the former Seaboard Air Line Railroad main line through Ocala to divert trains from the former Atlantic Coast Line Railroad main line through Orlando it is selling to the State of Florida for SunRail. The money for diverting the traffic will go to more infrastructure improvements on the old SAL line such as grade crossings, more sidings, better signaling, and the construction of several highway and road overpasses in congested areas. CSX will also build a brand new Intermodal facility southwest of Orlando in Polk County, abandoning its older, smaller, more expensive to operate facility in Orlando that is currently on the SunRail route. The upgraded CSX/SAL line via Ocala will handle the diverted traffic from Orlando and the old Intermodal facility and take it all to the new facility. – Palm Beach, Broward, and Miami-Dade Counties, the host counties of Tri-Rail, will all benefit from this legislation. In lieu of the desired $2.00 per day surcharge (A nice synonym for “tax.”) on rental cars in each of the three counties, excess state transportation funds will be used for Tri-Rail. Each of the three counties will still contribute to Tri-Rail finances on an annual basis, but the three counties will not be solely responsible for funding the commuter rail system. This will also most likely clear the way for a huge expansion of Tri-Rail into a “Y” shaped system. The former inland SAL main line Tri-Rail now calls home parallels – in some cases just by a matter of city blocks – the current main line of the Florida East Coast Railroad, a private subsidiary of RailAmerica, based here in Jacksovnille. The FEC for years has been hoping for a similar deal CSX received over two decades ago to sell its track and infrastructure to an expanded Tri-Rail system, while retaining similar rights as CSX has to run over Tri-Rail in off hours. As with CSX, the FEC would be relieved of the tax burden of ownership and the costs of maintenance and insurance on about 75 or so miles of very expensive, urban track and infrastructure if Tri-Rail buys its line from the north of West Palm Beach (Around Jupiter, Florida. ), south all the way into downtown Miami. Since Henry Flagler and the FEC in the late 19th and early 20th Centuries were the original builders of all of the East Coast of Florida south of St. Augustine for all practical purposes, the FEC line has a superior route through the middle of downtowns and urban areas than the old SAL line which was not completed into South Florida until the Florida Land Boom in the 1920s. The FEC had all of the downtowns and track which hugged the South Florida beaches, and the Seaboard was forced to build further to the west in the suburbs and swamplands on the edge of the Florida Everglades south of West Palm Beach where the line swung east from its route through Winter Haven, Sebring, and skirting Lake Okeechobee. Tri-Rail plans to keep its current system, and add trackage to the north and south of West Palm Beach on the FEC (The same trackage which is part of Amtrak’s high speed rail proposal for Florida vying for part of the $8 billion in stimulus money to be awarded later this Winter.). – Every other proposed commuter rail system in the country will benefit from the passage of the SunRail bill because from the beginning, the bill has been a model of rational, reasonable planning, with no pie-in-the-sky ridership figures, too conservative costs, or too extravagant revenue figures. SunRail was conceived and planned using real world numbers and real world expectations. Like the Northstar system in Minneapolis, and the Trinity system in the Dallas/Fort Worth area, SunRail most likely will exceed expectations on opening day. The deal struck with CSX, similar to the deal the Commonwealth of Massachusetts struck with CSX to expand its state commuter system outside of Boston, most likely will become a model for all future deals with CSX, which is good. CSX will receive huge benefits from the deal, which is to be expected as CSX acts on behalf of its shareholders. While CSX will benefit, the public will also benefit in any number of ways, not the least of which is access to private railroad infrastructure CSX has no duty to share with anyone else it doesn’t choose to do business with on any particular day. But, both the SunRail and Massachusetts projects demonstrate how everyone can win, and life goes on with everyone benefitting. – Amtrak will greatly benefit from SunRail; it will have the benefit of the upgraded infrastructure necessary for SunRail, plus the upgraded shared station facilities, and more friendly dispatching since there will be very little freight train activity south of Jacksonville (Where ALL freight trains came into Florida to be funneled south into Florida’s peninsula) on the former ACL line/now SunRail line for 61 miles in Central Florida. For about 210 miles from Jacksonville to the Auburndale cutoff where Amtrak trains turn from the former ACL line onto the former SAL line for the run into Miami, Amtrak trains should have a mostly clear shot of clean dispatching with very little freight train interference. This could lead to a shortening of Florida schedules since the northbound Silver Meteor and Silver usually arrive into Jacksonville ahead of schedule. Another benefit to Amtrak will be a heightened awareness of passenger rail travel by the commuters on SunRail; passenger-train-aware people are more likely to be receptive to long distance train travel. Hopefully, Amtrak will make the most of this by heavily promoting Amtrak trains at commuter stations. – U.S. Railcar, which is now the proud owner of the former Colorado Railcar designs for both single and bi-level commuter trains should benefit greatly from today’s vote. The original plan, when Colorado Railcar was still a viable company, called for that company’s DMUs to provide all of the motive power and consists for SunRail, and it’s highly likely any expansion of Tri-Rail in South Florida will also use these same DMUs which have undergone field tests on Tri-Rail in the past few years. Perhaps this will help U.S. Railcar with its request for a federal grant to construct a factory in Ohio to build these self-propelled railcars. – Real estate developers and entrepreneurs will benefit greatly. Even though Central Florida is very densely built-out and populated, look to new mixed use housing and retail and office developments to spring up within walking distance (Even in the Florida heat and rain in the Summer.) of the new SunRail stations. – Anyone who intentionally buys or builds a home near an existing railroad track which has been in place since the late 19th Century. The NIMBYs lost; the train tracks which were built to handle traffic will continue to do so, and those opposed to trains will have to find a life elsewhere. – The anti-rail talking heads who make careers out of making arguments which are usually a couple of French fries short of a Happy Meal against commuter rail and any other type of rail. Often, what’s old is new, and commuter rail is making a comeback in this country and will have a happy life alongside the automobile and sport utility vehicles of the world. While the return on investment in SunRail and Tri-Rail may not happen in exactly the same way or following the same formula which works for building more and more roads and highways, the ROI on commuter rail has a proven record of success beyond the tired “green” and “sustainability” arguments which are – by themselves – no complete arguments at all for huge projects such as commuter rail. – Asphalt and concrete manufacturers. Instead of laying literally miles and miles of asphalt and concrete on new roads, these folks will have to settle for acres of new asphalt and concrete on new commuter rail station parking lots and access roads. 4) As a final note, we should examine Amtrak’s role in all of this. Some had suggested in order to go around various liability questions with CSX and other issues before this bill was passed Amtrak should simply be the operator or SunRail, and many of those issues would go away. Amtrak is consistently the most expensive commuter system operator in the country, with a less than stellar record (See the immediate previous issue of TWA to this issue and the discussion of Amtrak’s failures in California operating the Pacific Surfliner service on behalf of California.). Here is something to think about: If Amtrak were no longer America’s best kept secret, and the company promoted itself like any other American company, more Americans would know of and understand passenger rail. Reading the online news articles about SunRail and the accompanying idiotic, knee-jerk reactions to SunRail by uninformed readers was a tragic exercise. It appears a certain element of our society absolutely hates anything to do with passenger rail, and think it should be consigned to museums and Third World countries. These people have no idea, nor rational concept of the many economic and social benefits of passenger rail. Many of these people would rather give up their firstborn child than their automobiles. There is nothing wrong with choice, just as there is nothing wrong with someone choosing to only travel in their personal vehicle. That’s the kind of choice we take for granted in this country, and we cherish to right to make that choice. But, while keeping that same right to choose, we should not be taking away the rights of others who choose to travel by a means other than a personal vehicle. Amtrak carries two tenths of one percent of America’s travelers, which is hardly a blip on anyone’s screen. Amtrak is – and remains – statistically irrelevant to American transportation. If Amtrak chose to be a healthy, relevant passenger carrier, then many of the arguments made against SunRail out of ignorance simply would not have added anything beyond puffs of hot air to the discussion. That was not the case, however; SunRail failed twice because no one knew how to make a rational argument for passenger rail against a determined foe, because no one knows about passenger rail. That is something Amtrak can do something about; it can stop being statistically irrelevant, and create a vision for the future which includes conventional passenger rail as part of our domestic transportation network. Until that happens, more prospective commuter rail systems are going to be delayed or shot down in flames because no one can talk intelligently about the sins and virtues of passenger rail in America. You MUST include your name, preferred e-mail address, and city and state where you live. If you have filters or firewalls placed on your Internet connection, set your e-mail to receive incoming mail from twa@unitedrail.org; we are unable to go through any approvals processes for individuals. This mailing list is kept strictly confidential and is not shared or used for any purposes other than distribution of This Week at Amtrak or related URPA materials. Copies of This Week at Amtrak are archived on URPA’s web site, www.unitedrail.org and also on www.todaywithjb.blogspot.com where other rail-related writings of Bruce Richardson may also be found. URPA leadership members are available for speaking engagements. 1) Paul Dyson, the Never Say Die President of the Rail Passenger Association of California and Nevada sent yet another love letter to Amtrak Interim President and CEO Joseph Boardman. Once again I must write to you about the catastrophic service failures on the Pacific Surfliner service. As I write hundreds of passengers are stranded by the locomotive failure of train 769 at San Diego. As a result I have been told that 796 from Goleta will be covered by buses this evening even though it would be possible to deadhead a crew to cover the service. – Make arrangements with the commuter operators Metrolink and Coaster to make standby trains available to you, with extra crews available to operate them. – Hire in some of the hundreds of idle freight locomotives and put a freight and a passenger locomotive on every train until you have put your own equipment in a state of good repair. – Negotiate a power pooling arrangement with the commuter operators. Many of their locomotives operate only about 30 hours per week. We are tired of excuses and inaction. We will be asking for a congressional hearing and state hearings to find out why California is paying so much to Amtrak for corridor service and getting so little in return. We look forward to your early response. 2) Mr. Dyson has perhaps directly targeted finding a solution to Amtrak’s ongoing misadventures. Even though Amtrak top executives directly appear before Congressional committees, they often leave with only a slap on the wrist and business as usual recommences. Those with a good understanding of history recall this same type of mischief took place with VIA Rail Canada in the late 1980s. In a parliamentary form of government such as in Canada, it doesn’t take an “act of Congress” to get things done; it only takes a vote in the Prime Minister’s cabinet to institute often drastic actions. That happened with VIA when it was unresponsive to its owner’s (the federal government of Canada) wishes, and ended up with its budget slashed so mercilessly, over half of VIA’s long distance system simply disappeared. No one wants to see Amtrak any smaller than it is today, but, at some point, Amtrak’s management must be made to understand they are not operating in a vacuum and they cannot operate on hubris alone in perpetuity. 3) Here is a letter which ended up in This Week at Amtrak’s mailbox this past week; it’s being circulated among over 30 state passenger rail associations. The natives are definitely restless, and the Army seems to be close to being in a state of agitated rebellion. Somebody better make sure the stockade doors at Amtrak are sturdy and can withstand assault. We in the rail-passenger advocacy community, along with friends and well-wishers outside the movement, are longtime supporters of expanded and improved rail passenger service in the U.S. As part of our support for passenger trains, we have supported Amtrak, standing by it and defending its funding in good times and bad. Now the times have changed, and the temper of our advocacy must change with it. The Obama administration’s embrace of passenger rail, including its unprecedented commitment $8 billion in American Recovery and Reinvestment Act funds, has lifted the nearly four-decade threat against American passenger trains. The breathing space afforded by this sea-change in public policy allows advocates to switch from a posture of defense to a more sober and measured examination of the American passenger train. We are deeply concerned by Amtrak's apparent unwillingness to embrace change, its reluctance to express a national vision and, most of all, its failure to develop a National Growth Plan with annual ridership targets, programmed frequency expansions, openings of new routes, and a major equipment-acquisition program designed both to support and stimulate ridership growth and route expansion. Amtrak seems unaware that a transportation revolution is under way in America. The Obama Administration and progressive leaders are now offering Amtrak an opportunity for expansion and growth. Unfortunately, Amtrak continues to be plagued by the same drift, inertia and self-doubt of the past. Indeed, Amtrak president Joseph Boardman himself noted that “there are a whole host of people here who don't know whether to believe,” implying that people who cannot make the transition will have to leave the company. President Boardman must now follow through on his observation. Amtrak must realize that if it is to prosper, it must make itself relevant to America's transportation needs to the point of being indispensable. It must take a proactive role in the design of our national rail passenger system rather than merely executing plans developed and funded by others. For the last 30 years Amtrak’s “business plan” has been: “If anybody wants us to run trains we’ll run them—just bring a check.” Outside of the Northeast Corridor, this message has been directed solely to state governments and has resulted in the addition of primarily intra-state trains. There has been no acknowledgment of any interstate route obligations beyond what Amtrak inherited from the private railroads. The company does not acknowledge any obligation to grow the interstate or overnight part of its business and has never designed a blueprint or sought funding for doing so. For example, in years past Amtrak could have offered to share the costs of developing a showcase corridor, such as Chicago-St. Louis, to demonstrate to Congress and to other regions of the nation how a properly designed, funded and operated passenger-rail service could stimulate economic growth in the communities it served. It could have advocated the development of such a service between Chicago and Florida, or between booming city pairs in the underserved Sun Belt, such as Phoenix and Los Angeles, or Dallas and Houston. Such a success would have led to calls for more service elsewhere, ensuring a better future for Amtrak, while blunting calls for its demise. But Amtrak never displayed the necessary initiative, and its absence did not go unnoticed by Amtrak’s adversaries as they subjected the company to one shutdown scenario after another. It is time for Amtrak to be its own best advocate, as well as the advocate for the traveling public and for passenger trains themselves. It can only strike the public as odd that while the president, the congressional leadership, the advocacy community and dozens of state departments of transportation call for a passenger-rail buildup, Amtrak itself is silent. A good first step for Amtrak to begin embracing the future would be through the placement of an equipment order large enough to allow system and frequency expansion. The company's current request for a 130-car order of new Viewliner II single-level cars and an option for 70 more cars, while praiseworthy, shows no vision for the future and ignores present and future capacity needs. This order will do little more than replace old, worn-out equipment. It will not allow for any meaningful expansion. To its credit, Amtrak recently proposed an additional 500- car order for new, standardized coaches, but these cars will only replace worn out Amfleet cars running primarily on the Northeast Corridor. It ignores the needs of the Superliner fleet and does nothing to address the need for new routes and additional frequencies on existing routes. When the ARRA funds suddenly became available in 2009, Amtrak didn’t even have a wish list ready and is only now belatedly beginning to talk about a large-scale acquisition program. Amtrak needs to get started on that list now. But, it must do more than propose an order for cars or locomotives. Priority should also be given to route planning and expansion. It should develop a real vision for expansion of the current Amtrak system, laying the foundation for a truly national network. The “Grid and Gateway” proposal by the National Association of Railroad Passengers represents an excellent start. Amtrak needs to evangelize governors, mayors, chambers of commerce, major colleges and universities and regional economic-development authorities about the good news robust train service can bring. It must champion trains nationally and regionally and lobby Congress for a national budget sufficient to support multi-state route expansions. It must court Congress, the Obama Administration, states, local leaders and others to promote its own survival and prosperity by developing plans for expansion that do not depend solely on the largesse of state legislatures. If Amtrak fails to do this, its relevance will continue to be a question in the minds of many. Apologists may plead that Amtrak has had to fight just to stay alive and has no “juice” to support a culture of growth. But even in a hostile environment – which all private businesses and public-sector agencies encounter at one time or another – real leaders continue to prepare plans and wish lists, float trial balloons and put together pilot projects to demonstrate a concept and build public support for more ambitious programs. We in the advocacy community have supported and defended Amtrak over the decades, but that support is conditional. If Amtrak wants our continued support, it will have to change, and soon. Amtrak must embrace the future, and if that means separating itself from those who feel comfortable only with the past, so be it. Nothing less will be acceptable. We are committed to the creation of a truly national rail passenger system by all possible means, whether it’s through Amtrak or some other approach. The time to build a national passenger-rail system is now and Amtrak must become proactive and forward-thinking or risk its own demise. Here is the only proper response to this letter: Amen. At last word, less than a half dozen state passenger rail associations have summoned the collective intestinal fortitude to endorse this letter. Many seem content to continue to do nothing and metaphorically play the fiddle while Amtrak burns around them. Now is not the time for cowardice; now is the time for action. If you are an active member of a state passenger rail association, demand your association not only endorse this letter, but begin to take action to force Amtrak to live up to its obligations to every American. As long as Amtrak management thinks it can continue to feed at the public trough and not have to worry about support, then it will continue to operate as it does today with managers more worried about hanging on long enough to collect their pensions rather than creating and growing a national passenger rail system which is robust and viable. Make it your personal New Year’s resolution to make Amtrak accountable to you and every other taxpayer in America. If we’re going to spend public money to keep Amtrak going, then we should be realizing a public benefit. 4) More from Ken Orski at Innovation NewsBriefs. This is Volume 20, Number 23; further information is available at www.innobriefs.com. A small but influential group of individuals gathered recently at the downtown Washington office of University of Virginia's Miller Center of Public Affairs at the invitation of its Director, former Virginia Gov. Gerald Baliles. The bipartisan group included two former U.S. Transportation Secretaries and some 30 key players and opinion leaders who constitute what could be loosely described as Washington's permanent transportation policy establishment. The purpose of the meeting was to solicit advice on a set of recommendations stemming from the Miller Center's transportation conference (see, "Reconsidering the Current Paradigm: Notes from the Miller Center Transportation Conference," NewsBrief, September 17, 2009). While the discussion dealt with a number of discrete issues to be addressed in the report, the central challenge was posed succinctly by Gov. Baliles at the outset of the meeting. The transportation sector, he suggested, is being neglected despite the evidence of a mounting crisis – aging infrastructure, growing traffic congestion, strained freight and logistical facilities. Both the Congress and the Administration are extemporizing rather than taking bold steps to avert the looming crisis. Where is the outrage? Baliles asked. Why is there no popular outcry? And what can we do to overcome this inertia? How can we create a sense of urgency and develop a narrative that will reverberate with the public, capture the media's attention and goad Congress and the Administration into action? The Governor's conclusion: we must involve "the three Ps": the Public, the Press and the Politicians. What follows is some reflections stimulated by the Miller Center discussion. Specifically, can we sell the notion that continued inaction on the transportation front is placing the nation at risk? Can we elevate the need for greater transportation investment and program reform to a higher priority on the nation's policy and legislative agenda? And how can we rally the public, the press and the politicians to support these goals? Does the public perceive a genuine "transportation crisis?" Opinions differ. While catastrophic failures such as the bridge collapse in the Twin Cities are a powerful reminder of the need for constant vigilance, such dramatic failures are happily few and far between. The public does not necessarily share the transportation officials' sense of urgency or alarm about "crumbling infrastructure." The Minneapolis bridge collapse is a fading memory. And while the severity of metropolitan traffic congestion and its adverse impact on the economy and people's lives are readily acknowledged, the driving public has grown skeptical that more money or program reform will bring effective congestion relief. Perhaps they have come to accept the truth of the oft-repeated skeptical refrain that "you cannot build your way out of traffic congestion." What is more, traffic congestion leaves vast stretches of rural and small-town America unaffected and unconcerned. As one participant pointed out, the average nationwide commute time of 25.5 minutes has not increased for the past eight years according to Bureau of the Census data. Traffic congestion may be of great concern to many individual communities, but it is not necessarily perceived as a "crisis" deserving national attention. We offer the above arguments not to refute the need for action, but to suggest that they provide a plausible explanation why there has been no public outcry about the stalled transportation authorization and no groundswell of public demand for a reform of the transportation program. If evoking an impending transportation crisis is not a convincing way to gain public support, could an appeal to the people's sense of vision be more effective? After all, America's transportation history has been marked by a series of ambitious transportation initiatives – Erie Canal and the transcontinental railroad in the 19th century, the Interstate Highway System, the urban rail transit networks and the air navigation system in the 20th century. Can't public support be rallied around a bold new transportation infrastructure agenda suitable for the 21st century? The positive reception given to President Obama's high speed rail initiative would suggest that a new transportation vision can still capture the public imagination. And if a giant new infrastructure program on the scale of the Interstate Highway Program no longer is financially feasible, could one not enlist public support for a more modest capital program that could still enhance the nation's infrastructure and contribute to economic growth? The answer, we believe, is a tentative "yes" – provided, as one participant noted, that the infrastructure plan is presented as a collection of tangible projects that could capture the public's imagination, rather than vague and poorly understood promises "to improve transportation performance." The popular press and mass media can be captivated by and serve as an effective communicator of bold new transportation visions – especially ones with a high technological content. The daily press and television also can effectively dramatize and draw public attention to spectacular transportation failures such as a bridge collapse or traffic gridlock. But the media's attention span is short and its ability to stay on subject is limited by a constantly shifting news focus. Moreover, many of the issues central to transportation reform are considered as too arcane by newspaper editors and editorial writers to be of interest to the general public. Trade and "niche" publications do provide more depth but their outreach and influence are limited to the client groups they serve. In principle, the blogosphere could serve as a useful educational tool. However, constituency-driven blogs are often tendentious and advocacy-driven. To properly inform and educate public opinion requires a flow of accurate information, diverse views and impartial analysis. Most blogs do not meet this test. We are left with a conclusion that getting one's message across will require a sophisticated outreach strategy that includes ability to connect with opinion makers outside the traditional communication channels. There are several explanations for the delayed plans to enact a transportation bill and more generally for transportation's relatively low standing on the list of Congressional and Administration priorities. The most obvious reason is the already crowded Obama policy agenda and the importance of the competing priorities of health care overhaul, the challenge of job creation, financial regulatory reform, and climate change. Contributing to the legislative inertia on the transportation front is the Administration's reluctance to use deficit financing or raising taxes to support expensive new government initiatives. Administration officials have signaled that the President's focus next year will bear heavily on bringing the deficit down. This mindset is matched on Capitol Hill. Lawmakers are conscious of the political and economic danger of increasing the national debt and reluctant in an election year to consider measures that would add to the soaring deficit. As one participant remarked, the political community refuses to buy into the crisis scenario or admit there is an infrastructure problem. Or else the problem is not viewed as serious enough to warrant additional deficit spending. There is an equal reluctance to consider tax increases. Proposals to enhance the Highway Trust fund revenue by raising the gas tax – to the extent such proposals are still heard these days – are coming from interested stakeholder groups and lobbyists rather than from the grassroots. And those meet with a skeptical reception on Capitol Hill, a bare 12 months before mid-term congressional elections. One telling indication has been the unwillingness of the House Ways and Means Committee to consider a tax hike to fund Rep. Oberstar's proposed $500 billion surface transportation bill. Suggestions as to other sources of funding – such as a National Infrastructure Bank or a federal capital budget, mileage (VMT) fees and financial transaction fees – have likewise met with deep congressional and White House skepticism. To be sure, there exists a possibility of a short-term infusion of funds in the context of a new job creation initiative. Highway and transit interests have seized on the White House "jobs summit" on December 3 to push for an $84 billion package of "ready-to-go" projects, and the House is readying a jobs bill that would provide up to $70 billion for "shovel-ready" infrastructure projects and aid to small business. However, this places transportation advocates in a quandary. They need to be part of the current job creation dialogue in order to stake out a claim to any stimulus funds that might be forthcoming. However, any short-term infusion of funds will remove – or at least seriously reduce – congressional urgency to act upon the larger need for strategic investment in transportation infrastructure aiming to promote long-term economic growth. This dilemma was evident in President Obama's remarks at the jobs summit. What's good in the long term, Obama is reported to have said, may not necessarily work as an immediate short term jobs stimulus, currently the Administration's paramount objective. There are tensions in the process of allocating infrastructure spending, he said, between immediate "shovel-ready" projects as opposed to long-term visionary projects. He intimated that the short-term goal to spur job growth would take priority in choosing projects over the long term need for strategic infrastructure investment. But some observers have raised questions whether even immediate "ready-to-go" transportation projects, such as pavement re-surfacing and highway beautification, create new jobs or merely keep existing DOT and contractor road crews fully occupied. Thus, the prospect for an early enactment of a reform-oriented multi-year surface transportation authorization remains murky. Rep. James Oberstar (D-MN), chairman of the House Transportation and Infrastructure Committee, has abandoned his quest to enact a six-year $500 billion bill by the end of the year in the face of continued Senate and House leadership opposition. Instead, he announced during a press conference on December 2, that he would agree to a six-month extension of the existing program, provided that there is an agreed upon time line for enacting a longer-term authorization. One possibility could be a staged process consisting of a two-year "front-loaded" transportation bill focused on job creation, followed by a longer-term bill containing broad policy reforms. However, at this point, the constantly shifting dynamics concerning the need for and type of a jobs stimulus makes any predictions about congressional action at the expiration of the current short-term extension on December 18 a mere speculation. Only one thing is certain: getting the lawmakers to enact an ambitious long-term surface transportation program in the tax- and deficit-averse political climate of an election year would be an uphill struggle. 5) And, on this final note, this missive arrived at This Week at Amtrak. Good thoughts for all to consider from Evan Stair of Passenger Rail Oklahoma. I thought you might like to take a look at the new Amtrak 2009 national route map. Isn't it pretty? I especially like the photograph of the train crossing at the top. Look at the inclusion of all those magnificent buses that flesh out the system... making it look twice as large as it really is. Oops... I guess someone forgot to tell the cartographer to remove the New Orleans to Florida segment of the Sunset Limited... Oh... excuse me? I guess Amtrak considers this just a "service disruption" so it has a rightful place on the map? 1) If this IS just a service disruption, then why did they have to study its restoration? Why not just start operating it again? 2) Since this is just a "service restoration" why did Amtrak see a need to study alternatives to its pre-Katrina operation? 3) Since this is a federally funded route disruption, shouldn't the financing of the restoration match that of its pre-Katrina operation? It seems that Katrina erased everything but the red ink on the National map. Needless to say, the four-year-and-counting "service disruption" and inclusion of an operational line on the Amtrak system map that has not operated for four years should be a source of embarrassment to Amtrak. In fact, it is false advertising. This map is displayed in Amtrak depots across the nation; possibly even travel agencies. It is included within travel planners and timetables. Fortunately, travel planners and timetables explain the situation. However, where is the disclaimer on the system map? 1) Today is the Tuesday before the Wednesday before Thanksgiving, and Wednesday is considered by everyone to be just about the busiest travel day of the year, even in times of recession. Once again, Amtrak is making its usual Herculean effort on the Northeast Corridor to shuttle holiday travelers between Washington, New York City, and Boston. 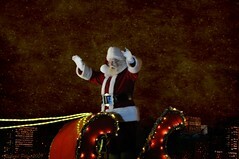 This year, there are also some additional services on the West Coast in California, and some extra goodies elsewhere. However, once again, there is a notable lack of beefing up of long distance trains throughout the nation; Amtrak apparently feels only people on the Left Coast and Right Coast, north of Virginia, celebrate Thanksgiving, and the rest of the country – as usual – are left to fend for themselves for holiday travel. Part of the problem is Amtrak’s lack of equipment, due to its deliberate plan to keep as much long distance equipment as possible out of service to save on maintenance costs. Never mind the revenue lost or new passengers to be served; Amtrak managers only receive recognition and bonuses on money saved, not money spent to improve the company’s core financial position. 2) All of that aside, it is important to pay respect to all of the Amtrak employees who will be working long and hard on Wednesday and Thursday, and throughout the holiday weekend taking care of their passengers. Amtrak is still a 365 day a year operation, and no matter that it’s Thanksgiving, Christmas Day, or any other holiday, dedicated Amtrak employees are out on the road, manning ticket windows in stations, cleaning cars in coach yards, and refueling locomotives all over the country, and we thank them for taking care of our needs while they are away from home and their families. 3) You may want to glance again at the date of this missive; one month from today is Christmas Eve. Finished your shopping, yet? William Lindley of Scottsdale, Arizona has some thoughts on the subject. Those of you who held General Motors shares and now hold the converted "Motors Liquidation Company" will be pleased (sarcasm alert) to know that according to their website (https://www.motorsliquidation.com/?evar10=InvestorInfo_MotorsLiquidation), at the end of the bankruptcy proceedings, it is the Company's expectation your remaining interest in "common stock will have no value." We could argue who was to blame for GM's failure – the unions? the management? the corporate culture? too much government regulation? not enough government assistance? – but the crux of the matter is, the board of directors – and particularly the president – are ultimately responsible for a corporation's performance. It was the board's, and the president's, responsibility to either guide the company to stability, or advise the stockholders far in advance of an impending failure. The board, and particularly the president, failed to do so. No-one should be much interested in placing blame now, though; words have little value, results have much. By the same token, we expect interim Amtrak president Joseph Boardman to be clear about his company's future. Many of us have heard him speak, with positive impressions. Yet the results that matter – reports stuffed with lackluster, unimaginative excuses instead of positive plans for restoring furloughed routes or opening new ones – ultimately rest under his watch. The failure to order equipment sufficient even to maintain current routes, ultimately rests under his watch. Look out your window. Do you see a tree or a shrub? It is doing one of two things – growing or dying. There is no middle ground, there is never stagnation. A business is the same way. Grow, or die. Is it Amtrak's intention simply to go gentle into the good night? If not, where is the bold plan, where is the vision for growth? Eagerly, we await. 1) Here is the text of a speech delivered to the Florida Coalition of Rail Passengers here in Jacksonville, Florida on Saturday, November 7, 2009 by this writer. It’s been an interesting week for the railroad business; changes we couldn’t imagine a decade ago have suddenly become true. America again has a “railroad robber baron” – but, this time, it’s a benevolent man who may be the smartest businessman in the world. Warren Buffett said he would cheerfully pay $34 billion for the Burlington Northern Santa Fe Railroad, and BNSF said they would cheerfully accept his offer. While many people agree this is not going to launch a series of mergers – there isn’t much left to merge other than creating a transcontinental railroad – this is a game changer. BNSF under private ownership no longer has to act by the dictates of Wall Street. Think of the BNSF deal as a giant-sized version of what happened to our own Florida East Coast Railroad: going private allowed it to think radically outside of the box. The FEC – after over a decade of waiting – has partnered with the Florida Department of Transportation and Amtrak to restore passenger service on its coast route between Jacksonville and Miami. Now, start thinking about BNSF and passenger service – they have already publicly indicated if the right business opportunity comes along, they will talk about it. Reading the FEC/FDOT proposal – which is part of the national grab for high speed rail stimulus money – gives any reader respect for the Florida DOT. Amtrak has its usual equipment demands, because both the Silver Meteor and Silver Star will again be split here in Jacksonville, and half of the consists will go to Miami via Orlando, and half go on the FEC. The best part is the request for additional local regional trains running between Jacksonville and Miami to provide a higher level of frequencies. The most obvious part left out is extending the Palmetto south of Savannah and running it down the FEC or perhaps over to Tampa. The only part of Florida’s rail plan found wanting is mention of doing something to bolster Tampa’s conventional train service. In the Tampa Bay area we have Florida’s second largest metropolitan area, and it’s level of train service is less than that of Sebring and Palatka. If you really want to look at the unfairness of it all, take a look at Florida’s panhandle. The people living there pay all of the same taxes we pay, but their train – the Sunset Limited – went away because Amtrak doesn’t want to bother restoring the train after a hurricane that happened over four years ago temporarily tore up some track. Let’s look at how Amtrak has treated us here in Florida over the past 25 years or so. Going back to the pre-Amtrak days, Florida had so many passenger trains you couldn’t walk very far without tripping over one. Florida was a state built by the passenger train. We had the Seaboard’s Silver Meteor, Silver Star, Palmland, Sunland, and Gulf Wind. Not only did we have service to Miami, but we also had service down the middle of the state and from Tampa down the west coast to Venice. The Atlantic Coast Line provided us with service on the East Coast Champion, West Coast Champion, Gulf Coast Special, seasonal Florida Special, and the Everglades. The ACL on the west coast would take you to Fort Myers. From Chicago and the Midwest, you could catch the City of Miami, South Wind, Seminole, or Dixie Flyer. Until just a couple of years prior to Amtrak, the Florida East Coast even operated its daily two car train between Miami and Jacksonville. Then came Amtrak Day in 1971. Amtrak Day wasn’t as bad for Florida as elsewhere, for we still had the Silver Meteor, Silver Star, Champion, and South Wind. We lost the Gulf Wind, and that huge – and currently unfilled gap – between Jacksonville and New Orleans opened up. We lost service south of Tampa on the west coast. But you could still get to Florida from Chicago with single train service, and you had three choices from New York to Florida, and both coasts and the middle of Florida through Ocala were still served. We all know what has happened since then. The once busy crew and maintenance base in Tampa is gone, with just a single daily train remaining. Naturally, this occurred only after the City of Tampa decided to spend a king’s ransom on the breathtaking restoration of Tampa Union Station. Miami, once the golden goose of passenger railroading, now has two trains a day. The South Wind, then the Floridian, with direct Chicago service, is gone. The Cross Florida service between Tampa and Miami came and went. The extended Palmetto from Savannah to Jacksonville, and eventually to Tampa, and then turned into the Silver Palm to Miami – is gone. We now have Auto Train, but unless you’re taking along your car and only have a destination of Northern Virginia or beyond, it’s not the most useful service in Amtrak’s stable. Then, there is the sad saga of the Sunset Limited. We all worked hard in Florida to bring the Sunset to us in 1993. The State of Florida ponied up over $7 million to help upgrade the CSX line in the panhandle. We knew prior to the Sunset’s extension, there was an average of 75,000 calls per year into the Amtrak res centers seeking a train between New Orleans and Florida. For a while, unknowing people tried to blame our friends – yes, make no mistake about it, at CSX they are our friends – for not allowing Amtrak to resume service on the Sunset. But, we know CSX gave Amtrak written notice the line was available for the Sunset on April 1, 2006. By law, when Amtrak cancels an entire train route, it is supposed to post a 180 day notice of cancellation. This minor technicality to Amtrak has never been honored, with the ongoing excuse of not only did the dog eat Amtrak’s homework, but Amtrak merely “suspended” the service due to conditions wrought by the hurricane. A number of union jobs on all levels were lost by the suspension of the Sunset. Yet, Amtrak’s unions have chosen to do nothing about this. No union filed a lawsuit, no union screamed at the top of its organized lungs about this flagrant abuse of the law. Congresswoman Corrine Brown put $1 million into last year’s Amtrak reauthorization to study the restoration of the Amtrak route. We know the result of that; a lot of paper with a lot of excuses and reasons why Amtrak doesn’t want to restart the service. The quickest, cheapest, cleanest way to restore service is to extend the City of New Orleans from New Orleans to Orlando. Because of bad equipment scheduling, the City trainsets sit for a full day in New Orleans before they return to Chicago. On any given day there are two trainsets in Louisiana, the one just departing New Orleans Union Passenger Terminal and the one about to arrive at NOUPT. By extending the route to Orlando, only one extra trainset would be required to bring the train to Florida. Amtrak will instantly whine about stations; the only real station problem is at Mobile, where the Eisenhower-era relic of the L&N Railroad’s poor choice of architect station building was mercifully torn down after Katrina. The only problem for Mobile is finding a new spot for a platform and placement of a temporary Amshack. Remember, the only manned stations between New Orleans and Jacksonville were Mobile, Pensacola, and Tallahassee. Everything else was just a platform and city-run shelter. Many of my readers of This Week at Amtrak know I talk about the Sunset and the City of New Orleans a lot, and there’s a reason for that. From 1996 to 2000, I was a paid consultant to the Gulf Coast Business Group, working with both of those trains, plus the Crescent. My late business partner and I specialized in marketing for these trains, creating onboard services programs, the highly successful 24 hour dining car test runs on the Sunset, and handled special events, such as station openings and helped with the inaugural of the Gulf Coast Limited. Even today, those are still my trains. From 1999 to 2000, we ran the Sunset Limited and City of New Orleans Promotional Office for Amtrak from our offices here in Jacksonville. We worked a number of projects that brought new riders to the Sunset and City through radio and television station promotions, worked with local media, and even hosted a dining car gathering in Memphis for local and regional media food critics. Like any large company, we found white hats and black hats inside of Amtrak. Some very good people left because of the constant problems caused by the black hats, and others left merely because Amtrak was not the most pleasant place to work if you weren’t part of the good old boy network. But, there is a shrinking core group of dedicated people who are there because they like running passenger trains. What can we do to help those at Amtrak who want the company to succeed? First, everyone must realize there is more than one answer to Amtrak’s problems. Those who constantly plead “we all have to work together” generally mean we all have to agree with them, and forget about any other solutions. Second, we have to realize the reality of passenger rail around the world. Amtrak constantly wants us to believe no passenger rail system in the world makes money. This is only an excuse to enable Amtrak’s dysfunctional behavior. I invite you to do your own research; scan credible publications like the International Railway Journal and read the stories about passenger rail systems in The Netherlands, Germany, and Japan which make money. Doubters say this isn’t true, these companies are still propped up by their governments. Wrong. Some of these systems may operate over government owned right of way – just as trains do on the Northeast Corridor – but they still pay a train mile fee. Some of the systems share the rails with freight trains – just like Amtrak – and they receive a benefit – just like Amtrak – from the shared cost of infrastructure. For years, URPA has been crunching numbers and seeing almost every long distance train in the Amtrak system makes money “above the rail.” This is the same system used by other countries – based on operating costs, not full infrastructure maintenance costs – and revenue passenger miles. One thing URPA has talked about for decades is Amtrak’s erroneous use of warm body counts in the form of ridership instead of the real world metrics of load factor and revenue passenger miles. Amtrak wants us to be wowed by warm body counts, which are meaningless. What matters is how far you carry a passenger, and what revenue you derive from a passenger, not how many passengers. Which passenger would you rather have: one passenger traveling the 608 mile average length of trip on the Silver Meteor at 15.7 cents a revenue passenger mile ... or four passengers on Oklahoma’s Heartland Flyer, traveling an average length of trip of 175 miles at 12 cents a revenue passenger mile? That one passenger on the Meteor not only makes Amtrak more money than the four passengers on the Heartland Flyer, but that one passenger will also spend more money onboard in the diner and lounge, had less cost to the national reservations system, less to reach through marketing, and tracks all the way through Amtrak’s accounting system with less costs because Amtrak is handling one passenger instead of four. When the late Graham Claytor – without a doubt Amtrak’s best president – retired from Amtrak in 1993, the company was generating internally enough money to cover 72% of its 1989 $1.7 billion operating budget, up from 48% in 1981. Today, that number has slipped dramatically, down to about 60%. Since Mr. Claytor retired, we have seen a virtual parade of permanent and semi-permanent interim chief executive for Amtrak, from Tom Downs to George Warrington to David Gunn to David Hughes to Alex Kummant to today’s Joe Boardman. Every new Amtrak president seems to have made the company worse in so many ways. We’ve seen the Heritage fleet – which is highly valued and treasured by VIA Rail Canada today – sold off. The original Pennsylvania Railroad Metroliners were scrapped. The Turboliners were rehabbed with someone else’s money, and then suddenly hidden and stored, and are now for sale. We have seen the delivery – and subsequent running off the wheels – of the too small order of Viewliners, with a promise, but no firm order for any more. We’ve seen a more than decade old order of Superliners, but those numbers are thinning due to neglected maintenance. We’ve seen the much heralded arrival of the Acela trainsets, but their mechanical troubles, too, have become legendary. In short, Amtrak has no reserve equipment pool it can activate quickly to expand or create new services. Even though there are still nearly 200 cars sitting in the wreck line, most of that is needed just to restore existing consists to previous levels of productivity, or put a service back east of New Orleans. During all of this while we have seen meaningless ridership numbers rise, we’ve also seen abysmal systemwide load factors; during some years more than half of Amtrak’s highly perishable inventory goes unsold. We have seen train consists shrink and shrink. So, Amtrak is running fewer seats miles for occupancy, creating less of a chance for success. Its equipment is old and getting more worn out by the hour. We know some equipment is being rehabbed by this year’s stimulus money, but it’s only token amounts for the national system. Which brings us back to, what can you do to help change Amtrak? I urge everyone in this room to start a new campaign. The Cardinal is the only train in Amtrak’s entire system which is run by federal mandate. Senator Robert Byrd slipped into federal law that his train – the Cardinal running through his home state of West Virginia – has to be operated. Amtrak uses and abuses this train, but it’s helpless to cancel it the way it did the east end of the Sunset Limited. My conservative soul is tortured by this next suggestion, but it may be necessary until Amtrak can be made to run like a real business. FCRP needs to convince the Florida Congressional Delegation the Silver Meteor, Silver Star, and an extended Palmetto south from Savannah to Jacksonville and beyond, and some sort of restored service east of New Orleans, must be mandated to be operated by federal statute. Your sister organizations in other states need to do the same with their trains. Remember – if it happened to the Sunset Limited east of New Orleans – it can happen to any train. Most of you know the very most basic rule of railroad safety: when on railroad property, be prepared for a train to be coming towards you at any time, from any direction. You know the second most basic safety rule – the one which separates real railroaders from rail fans – never, never, never, step on top of the rail; always step over the rail. Florida – and every other state – is currently standing on top of the rail, unaware a train is bearing down from an unknown direction. Amtrak’s management is much more interested in seeking free federal monies than in operating trains. We’ve seen no new equipment orders to date – just promises of a single-level order for Viewliner cars – and the just released update of Amtrak’s ongoing five year plan calls for no new cars. If Amtrak is serious about keeping its system intact, it would be at least talking about a new car order, especially for Superliners. But, the silence is all we need to know. Paul Dyson, President of the Railroad Passenger Association of California and Nevada, has openly raised the question of whether or not Amtrak is actually planning to exit the long distance route business because of a lack of equipment order. A few weeks back, one of our URPA associates was attending a rail fair in the Northeast. He ran across an Amtrak Engineering Department intern who wanted the world to know how important he was – after all, he was an intern at Amtrak. So, if you’re [FCRP member] Jerry Sullivan and you want to travel west to visit your grandchildren in Texas, it’s not likely to happen any time soon on a restored Sunset Limited. If you’re George Bollinger and you just want to ride trains, you better plan your trip early, because too often you can’t get there from here. Amtrak today accounts for only two tenths of one percent of America’s transportation output, hardly enough for anyone to take seriously. Even worse, Amtrak isn’t doing much to change that. The only people Amtrak listens to is Congress, when it mandates Amtrak do something. It’s time for Congress to mandate – without exception – Amtrak must run all of its long distance trains, and throw in some restorations like the Sunset back to Florida, the Pioneer, with a full second frequency operating all the way between Chicago and Denver, the North Coast Hiawatha, and take the Sunset and the Cardinal daily. Amtrak will kick and scream and whine everyone is being mean to it by making it run trains it doesn’t want to run. But, if someone doesn’t do something this drastic soon, long distance passenger rail in America will be only a memory like steam locomotives, dome cars, and Pullman berths. Thank you so much for allowing me to be with you today; it’s a pleasure to be here. 2) Warren Buffett’s privatization of the venerable Burlington Northern Santa Fe rocked the railroad world. Here is what William Lindley of Scottsdale, Arizona had to say. Warren Buffett's offer for BNSF the first week in November might prove to be a pivotal event for intercity passenger rail, having come at a time when, as Don Phillips in his recent Trains magazine column recently highlighted, dissatisfaction over Amtrak's seeming refusal to participate in a renaissance of train travel is at a peak. Undoubtedly, Buffett has a record of making sound business decisions; and BNSF, being among the best managed and progressive of large railroads, does fit a motif of acquiring something good and making it better. Over the next weeks we will look at some of the synergies (much as that word is overused, it does apply here) and economies of scale that could apply to an enlarged role for BNSF in the passenger train business. But right now a single move would signal a positive direction. Words and attitude cost little but mean much; as you may know, trademarks, unlike copyrights and patents, are most defensible when they are in continuous business use. BNSF could gain much publicity, and build on its widespread and long standing – even if subconscious – recognition, by reviving its classic red, yellow, and silver "Warbonnet" scheme. A new interpretation of their classic corporate symbol would show a revived interest in being a participating citizen in every railroad town and city. Not to mention the free advertising garnered from rolling under practically every child's Christmas tree. Renewing interest in today's youth will perpetuate the recent industry rediscovery that trains are good for more than just hauling coal – they are the future of transportation, as well as the history. Yes, we undoubtedly will consider details in our upcoming columns here, but for now, Mr. Buffett, we simply convey – Welcome to the world of railroading. 3) Professor James McCommons of Northern Michigan University has a new book out this month, and it’s required reading for anyone interested in the business of passenger railroading. For full disclosure, this writer was interviewed for the book here in Jacksonville by Mr. McCommons. The interview was full of serious, well thought out questions and observations; it’s very clear the product of all of his interviews and research has led Mr. McCommons to creating a book far any beyond anything else on the market today regarding passenger rail as it stands in America. “Waiting on the Train: The Embattled Future of Passenger Rail Service – A Year Spent Riding Across America” is much more succinct than its title, and presents a wide variety of honest opinions and thoughts about passenger rail. More than just the usual viewpoints are presented with conclusions both obvious and left for the reader to determine. The book is actually too short; Mr. McCommons reports his publisher, Chelsea Green (www.chelseagreen.com) had him remove about 40,000 words of his original text to fit into a predetermined format. What a shame; when you read the book, you are wanting more, and another brief 40,000 words would be welcomed by any reader. There is a lengthy review of the book in the current issue of Passenger Train Journal magazine by Karl Zimmermann for those wishing more detail, but, please, if your buy just one railroad book this year, buy “Waiting on the Train;” it’s time and money well spent. We can only hope Mr. McCommons will one day do a follow-up book. 4) Speaking of the latest issue of Passenger Train Journal (2009:4, Issue 241) which just hit the newsstands in the past week or so, there is an ever-so-timely article on Amtrak’s Pioneer, the subject of much discussion for an expensive route restoration, as well as the usual mix of good articles and photos. Editor Mike Schafer’s On The Point column – as always – not only hits the mark about the Pioneer, but covers some other good points, too. Other rail magazines may publish more frequently, but Passenger Train Journal remains the magazine of record for the business of passenger trains. 5) And, this e-mail to TWA arrived shortly after the last issue was published regarding VIA Rail Canada. I am a big fan of VIA and have been doing a yearly trip from Toronto to Vancouver on that lovely train, the Canadian for quite a few years. About a year ago, I wrote a comment to Crain's Chicago Business online about Amtrak and their lack of interest in taking care of their equipment. When we board the Canadian in Toronto, she is shining, the windows are spotless, (glass, not micro scratched plastic), flowers are fresh and the crew seems happy to see us! A couple of weeks ago, we went from Portland, Maine to New York City, and while waiting in Boston to transfer trains, several Acela's came and went: they were already grimy and neglected looking. One of my stories about VIA involved what I consider to be a remarkable piece of quality railroading when the Canadian from the west was delayed by a blizzard and a freight accident making it too late east to turn. VIA put together a very spiffy "shuttle" consist which left on schedule from Toronto with a complementary lunch, complementary wine too!, and in several hours we rendezvoused with the now turned train and proceeded west, right on schedule. I asked a supervisor how this feat was accomplished, to which he replied, "it is all a matter of attitude." Says it all about the difference between VIA and Amtrak.